A unified security solution for a new era of digital transformation. Join our technical team as they provide a deeper dive into the Kaspersky Anti-Targeted Attack (KATA) and Kaspersky Endpoint Detection and Response (EDR) platforms. - it delivers complete visibility across the distributed enterprise environment, together with global threat statistics and reputations, providing contextualised, actionable Intelligence. - multi-dimensional advanced detection combines machine learning with advanced detection capabilities using static, behavioural, cloud reputation, sandboxing and pattern based detection engines, together with a Targeted Attack Analyser. This session is highly recommended for technical roles and continues our series of technical talks. If you missed a previous one please check it out on our On-Demand Service. Kaspersky Lab is proud to announce that in April 2019 we launched the latest release of Kaspersky Security Center and Kaspersky Endpoint Security for Windows. This new release includes a new web based console, seamless upgrade, encrypted traffic scan, adaptive anomaly control, amongst other new features. This webinar will guide you through the process of upgrading Kaspersky Security Center & Endpoint Security for Windows as well as an explanation and demonstration of features. 24/7 connectivity is fast becoming an integral part of everyday life. Most of us now routinely bank, shop and socialise online, and the Internet is the life-blood of business. Yet too many of us fail to secure our online identities adequately. This presentation will examine why this is important, what we should do to secure our online accounts and how criminals exploit our lack of security. Steven Furnell is a the Associate Dean and IT Security Professor at the University of Plymouth. His research interests spans multiple areas including: Cyber Security / IT Security, including user authentication, biometrics, cyber crime, intrusion detection and response, security management and culture, usable security; Internet Technologies and Applications; Mobility. A published author, Steven will share his insights we can all individually make it harder for Cyber Criminals to access your passwords. David Emm is a Principle Research Analyst at Kaspersky Lab and regularly delivers presentations on malware and other IT security threats at industry events, highlighting what organisations and consumers can do to stay safe online. He also provides comment to broadcast and print media on the ever-changing cyber-security and threat landscape. David has a strong interest in malware, ID theft and the human aspects of security, and is a knowledgeable adviser on all aspects of online security. 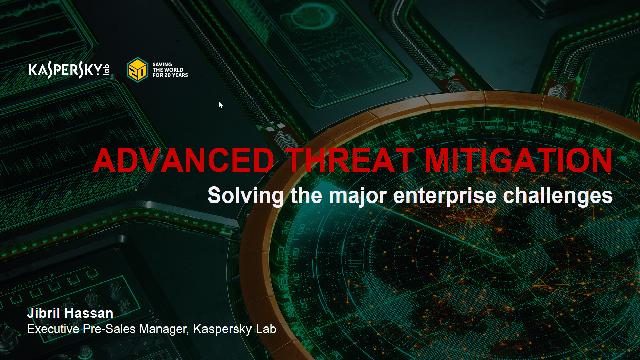 Threat Intelligence Services from Kaspersky Lab gives you access to the intelligence you need to mitigate against threats, provided by our world-leading team of researchers and analysts. Kaspersky Lab’s knowledge, experience and deep intelligence on every aspect of cybersecurity has made it the trusted partner of the world’s premier law enforcement and government agencies, including INTERPOL and leading CERTs. You too can leverage this intelligence in your organisation today. Join Jibril Hassan as he introduces the Threat Intelligence Portal and showcases how to optimise this valuable resource to keep your organisation safe from attacks. Gain some valuable insights to help manage your cyber security with confidence. Targeted attacks are now an established part of the threat landscape and in 2017 the headlines were full of news about sophisticated attacks of all kinds. Some were highly-targeted, others affected many businesses and quickly reached epidemic proportions. Often the motive was clear - to gather data, to make money, to cause damage and disruption. But sometimes the lines between these became blurred. It's clear that organisations of all kinds need to understand and prepare for cyber-threats affecting their sector. And this must start with an understanding of the current threat landscape and how it's likely to develop. This presentation will outline the trends we're seeing and offer some predictions for 2018 and beyond - based on our analysis of attacks in 2017. David joined Kaspersky Lab in 2004. He is a member of the company's Global Research and Analysis Team and has worked in the anti-malware industry since 1990 in a variety of roles, including that of Senior Technology Consultant at Dr Solomon's Software, and Systems Engineer and Product Manager at McAfee. In his current role, David regularly delivers presentations on malware and other IT security threats at industry events, highlighting what organisations and consumers can do to stay safe online. He also provides comment to broadcast and print media on the ever-changing cyber-security and threat landscape. David has a strong interest in malware, ID theft and the human aspects of security, and is a knowledgeable advisor on all aspects of online security. David is regularly mentioned in national print press as a cyber-security expert and has a wealth of experience in being filmed for such programmes as Good Morning Britain and BBC News. Engineered for private and public clouds it enables you to build a perfectly orchestrated and adaptive cybersecurity ecosystem, delivering the seamlessly orchestrated capabilities your multi-cloud workloads require, without compromising resource efficiency. Kaspersky Hybrid Cloud Security has been engineered to protect applications and data on your physical, virtual and cloud workloads, ensuring business sustainability and accelerating compliance across your entire multi-cloud environment. Join Mark Olding as he navigates the changing face of a Corporate IT environment. Discover how Cloud adoption has changed and how Kaspersky Hybrid Cloud can help safeguard your cloud transition. More than 80% of all cyber-incidents are caused by human error. Enterprises lose millions recovering from staff-related incidents – but traditional training programs usually fail to achieve the desired behavioural changes and motivation. Understanding what lies behind any learning and teaching process helps to build an effective educational program. Our programs not only deliver knowledge, but – more importantly – change habits and form the new behaviour patterns that are the real goal of awareness training. Join us as we reveal how including a robust security awareness strategy will help customers mitigate against incidents and how to foster good policies for greater protection. We have witnessed many developments during our 20year+ service operating within the cybersecurity business. Today, IT security is a constant process, that requires addressing threats holistically with a comprehensive set of solutions and multi-layered protection technologies, that goes beyond the mere prevention of cybersecurity incidents. Complex attacks need to be detected, threat response is a must, and businesses also need intelligence to predict future attacks. The efficiency of this multidimensional and multifaceted process depends on many factors. Join Lee Rendell as he uncovers what HuMachine is and how your organisation can benefit from True Cybersecurity, that not only prevents incidents, but also predicts, detects and responds to them effectively, flexibly and reliably. So far during 2018, we have seen some interesting developments in the Advanced Persistent Threat landscape. Participants will have the opportunity to ask questions about these developments – as well as any related areas of concern – helping them to develop the knowledge required to protect their organisations against APTs. Ransomware is an ever growing threat to businesses of all sizes and is at the front of most company security processes. Join Lee Rendell as he takes you through current Ransomware trends, numbers and detections, evolution and future predictions. Then he’ll show you how to setup and use Kaspersky Endpoint Security to best protect you against Ransomware and it’s effects. This survival guide will help keep you protected from a ransomware attack. Join us as we reveal how including a robust security awareness strategy will mitigate incidents and how to foster good policies for greater protection. Developed specifically for small and medium-sized businesses, Kaspersky Endpoint Security Cloud lets you manage security for multiple endpoints, mobile devices, and file servers remotely, from anywhere. Join Lee Rendell from our UK Pre-Sales team as he takes you through the web console, helping you understand the management, deployment, and security profiles. With KESCloud 6.0, we'll also look at the new features of this version and also talk about what is coming in the future regarding this solution. 3.5 million emails are sent every second..... It only takes one to bring down your business. Register today to learn how Kaspersky Security for Microsoft Office 365 uses advanced heuristics, sandboxing, machine learning and other Next Generation technologies to protect email from ransomware, malicious attachments, spam, phishing, business e-mail compromise (BEC) and unknown threats. Like Microsoft Office 365 it’s hosted in the cloud. And like all Kaspersky Lab solutions it’s built on the world’s most tested, most awarded security. Keep communications flowing and cyberthreats out with Kaspersky Security for Microsoft Office 365.